Cheap Mama Chick: Wittlebee- 6 pieces of NEW name brand clothing just $18 shipped, $3 a piece! Wittlebee- 6 pieces of NEW name brand clothing just $18 shipped, $3 a piece! Sign up today for a Wittlebee membership (here)! and use code PETUNIA to save 55% on your first month of adorable clothing! This deal makes 6 pieces of NEW name brand clothing just $18 shipped, $3 a piece! You can pause or cancel at anytime. HURRY! This code expires at midnight tonight (9/14)! 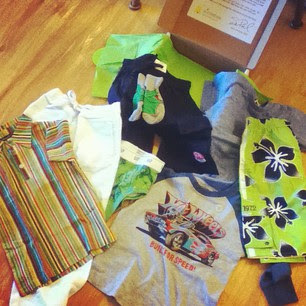 Wittlebee is a customized box of clothes that arrives at your door in about two weeks. Every box contains about $100 in retail value of new name brand clothes (for just $18 with the code above TODAY ONLY). Items from GAP, Gymboree, Hurley, Paul Frank, Tea Collection and tons more! You pick the size and styles you'd prefer (sporty, preppy, pink, etc.). Pictured above is just one of the fun boxes we've received - we are always pleased with the monthly surprises from Wittlebee!